Pistahang Cebuana 25th Anniversary Cebu Concert is presented by Cebuana Lhuillier exclusively to its 24K Cebuana Card holders on September 14, 2012 at Cebu Coliseum Complex. This special event is Cebuana’s way of giving back to its clients for 25 years of overwhelming support. Expect a colorful Pistahang Cebuana way of Filipino celebrations with Philippine fiesta inside the Cebu coliseum. Pistahang Cebuana Lhuillier Brand Ambassadress Sarah Geronimo together with Mark Bautista, Erik Santos and G-Force. Watch out for some concert treats like a raffle prizes and more. It will be a night of fun, excitement, and celebration. Ambassador Philippe Lhuillier, PJLI Chairman Jean Henri Lhuillier, PJLI President & CEO PJ Lhuillier and top executives are expected to be at the Concert. 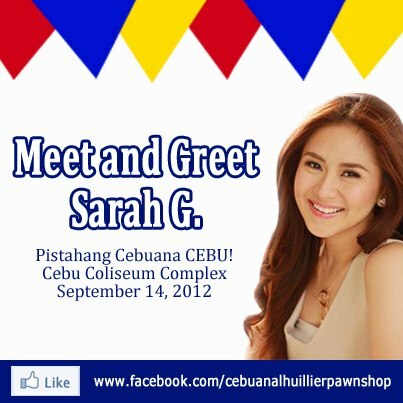 How to get Pistahang Cebuana Concert tickets? Be a 24k Cebuana member. Use your points for a free ticket. You can also tag along a friend using your card points. Ask Cebuana Lhuillier friendly branch personnel for more information. Cebuana Lhuillier Pawnshop has been the leading pawnshop chain in the Philippines with over 1,500 branches across the country. Cebuana offers services like pawning, local and international remittance, insurance, bills payment, e-load, collection, and foreign exchange to its customers. Cebuana Lhuillier is founded in 1987 by the current Philippine envoy to Portugal, Ambassador Philippe Jones Lhuillier, Cebuana Lhuillier is currently managed by its President and CEO, Jean Henri Lhuillier. 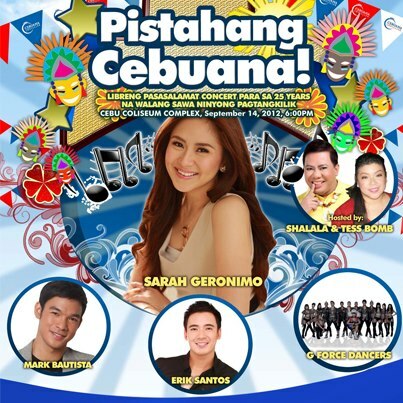 0 comments: on "Pistahang Cebuana Cebu Concert with Sarah G, Erik Santos and G-Force"